It is necessary for a machine to communicate with a loading robot if the features are to be exploited, safety assured and optimum performance achieved. The link means that the loading system and the CNC machine can work together. A good example of this is that the loading robot must know whether the door of the machine is open or not. For this, the machine sends the correct signal to the robot. 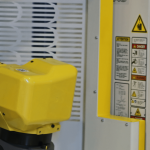 The loading robot then knows that it may load the product into the machine’s clamp. After this, the machine needs to know once again that the product is in place, so that it can grab it. 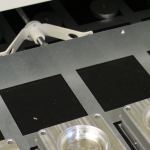 The machine, in turn, sends a signal to the robot to tell it that it can release the product. What is needed to link a machine? Before a robot unit is sold, we always ask the question: “What type of robot interface does your machine have?” The answer to this question allows Cellro to determine which machine link we need to configure. That may, for example, be Profibus/Profinet, Ethernet, hard-wired IO or Fanuc IO link. 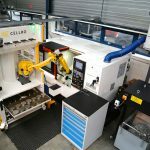 Cellro is flexible in this regard; machine manufacturers have their own protocols and machine controls. As a manufacturer of automation solutions, Cellro is able to adapt accordingly. I have an old(er) machine. Can it be automated? The age of the machine does not have to be a reason for a link to not be made. It depends on how the machine was designed and produced. 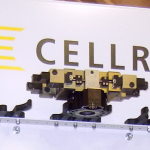 Cellro would be pleased to determine whether a type of machine is suitable for a machine link. My machine still needs to be updated. What requirements does it have to meet? Machine interfaces are extremely different. A standard list of requirements cannot be drawn up. If you would like to automate using a loading system, Cellro will be happy to indicate what the update of your machine should include. (We prefer to work with Profibus/Profinet or hard-wired IO.) The machine manufacturer can prepare the link based on the document received. Do you have any additional questions? If so, contact one of our experts. It is necessary for the machine to send a signal to the loading robot and vice versa for them to be able to work together. The machine link at Cellro goes a step further. In exceptional cases, something could go wrong. If this happens, the systems must be able to detect the problem so they are able to switch the machine and the robot cell off. The same applies in the event that an employee presses the emergency stop button; the machine and/or robot cell must be switched off. Cellro is able to send these safety signals. Xcelerate can be linked to different CNC machines. Four machine interfaces can be prepared in the software. Using a ‘smart’ connector, Xcelerate knows which machine it is linked to. All that is left for you to do as a customer is to move Xcelerate from machine A to machine B. Everything else will be resolved automatically. If you have purchased Xcelerate, our software engineers will take care of the rest. If you want to use a Collet Exchange or Fixture Exchange module, a more extensive interface is required so that it, too, can be automated. The interface must now feature ‘number communication’, which enables NC numbers and names to be sent from Xcelerate Job Manager to the machine. What else is required to automate your machine? It is possible to automate your machine even if the machine manufacturer is not able to automate the door. Cellro may be able to do this for you. Our experts are always on hand to give you advice tailored to your situation and help you find your optimal automation solution. You can contact us at any time to discuss this. Next post I have purchased an Xcelerate. What now?